Drexel University College of Medicine Legacy Center: What Did She Say? Click the image to view these notes in a page-turning viewer. Handwritten lecture notes of Sarah Hibbbard, including reference to the Jeering Episode (starting on page 31). Possible thesis draft. 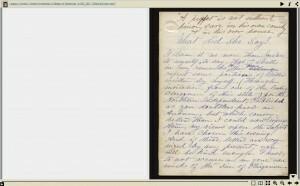 Click the image to view the McGavran journal in a page-turning viewer. 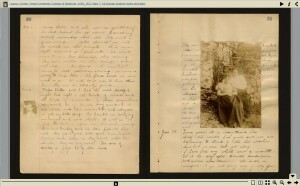 Ledger with student notes, a diary and photographs; kept by Mary McGavran, Woman’s Medical College graduate 1895. 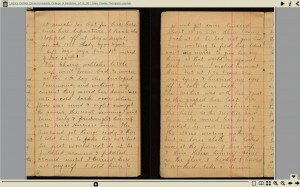 Click the image to view the Mary Fowler Thompson diary in a page-turning viewer. Mary Fowler-Thompson, M.D., was a medical missionary to Rangoon (Burma). She was an 1889 graduate of the Woman’s Medical College of Chicago. Journal includes English-Burmese words and phrases at back of book.